Fashion weeks often get criticized for maintaining an archaic tradition. It's not hard to see why large-scale runway productions feel out of touch with the reality of how the industry operates. Which is why it's refreshing to see labels, especially design powerhouses like Prada, embracing a forward-thinking approach to putting on a runway show. For its fall collection, Prada opted for a decidedly tech-savvy promotion strategy. Custom-made GIFs decorated the Instagram Stories of fashion insiders leading up the show, which was, if we do say so ourselves, pretty genius. Anyone with any reason to post about the show wanted to use the quirky and colorful designs to up their content game, which made it all but impossible to ignore Prada's digital presence if you follow more than one person in who works in fashion. Sure, GIFs may be the language of the next generation, but as for the voices behind them, Prada tapped not an important model or celebrity, but a computer-generated model who goes by the name Miquela and boasts more than 600,000 Instagram followers. As for the clothes themselves? Electric highlighter colors meshed with retro sporty influences for a result that we probably won't be worthy of until the year 3018. With so much discussion surrounding diversity at the New York shows this season, it was uplifting to see Prada pushing things further for the European houses. 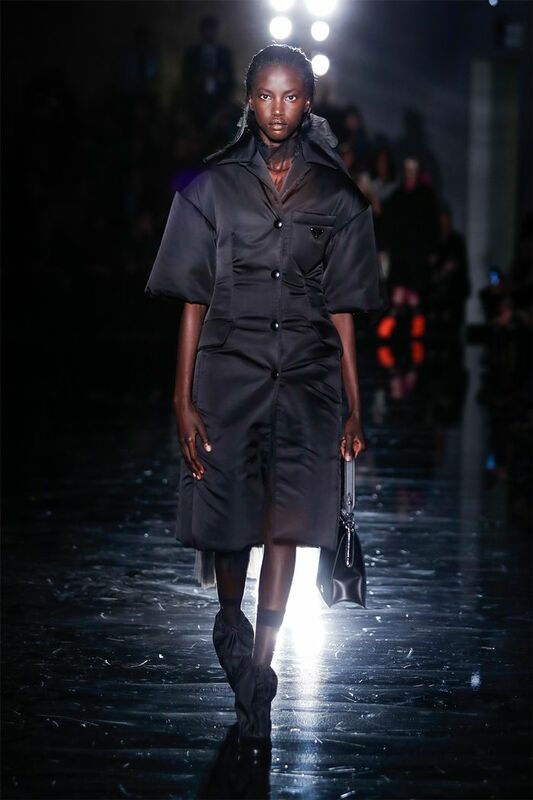 Model Anok Yai opened the runway, making her the first black model to open a Prada show. We're hoping that the casting decisions here will prompt other major houses to follow suit in the coming seasons. There's something retro about envisioning a future filled with candy-colored work boots and metallic fringe, complete with ID badges. In fact, the whole thing was very Zenon: Girl of the 21st Century—or the "Fifteen Million Merits" episode of Black Mirror, depending on how you look at it. Surprise! Bucket hats are far from dead in Prada's utopic vision of the future. Sportswear elements come into play through a quarter-zip vest and a neon color palette that can only be described as electric. Oh, and socks with sandals? Sure, why not? To market the show on social media, Prada turned not to a Kardashian or a Hadid but instead a computer-generated It girl. Welcome to 2018 (er, 3018), everyone, where a virtual personality can have just as much influence as anyone else who exists IRL.